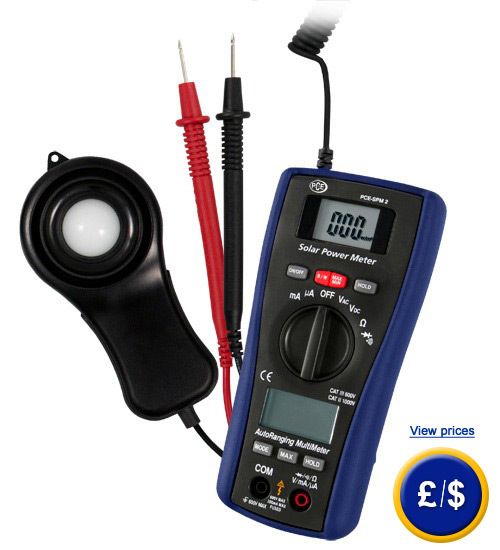 The solar analyser PCE-SPM 2, is a multifunctional hand-held meter 2 in 1. 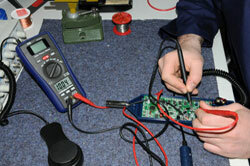 We have installed a multimeter and a solar energy meter with an external sensor in the solar analyser. The external sensor will measure solar radiation intensity instantly in watts per square meter (W / m²) (you can switch the unit to sq. foot (ft ² / h). Moreover, the solar analyser offers the ability to display the maximum and minimum values and the HOLD function of the latest measurement taken. The measurements obtained will help assess energy performance correctly and the efficiency of photovoltaic cells. 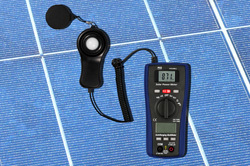 The meter integrated in the solar analyser enables other types of measurements and to get the measured values of solar panels with voltage AC / DC to 600 V, AC / DC and resistance to 20.00MΩ easily. Therefore, the solar analyser allows you to detect failures when making control measurements, which in turn, helps to prevent costly repairs. The max ., min and HOLD functions are also available on this meter. The solar analyser is equipped with two displays and allows simultaneous measurements of individual components. Here you can find other solar analysers with integrated data logger for analysis of efficiency. Overload indicator LCD indicates "OL"